The Scoop: Over the last 13 years, Damona Hoffman has become an authority in the dating scene by working with singles in person and on television in the TV series #BlackLove and A Question of Love on A&E Networks. In personalized coaching sessions, she taught her clients how to market themselves online and increase their response rates. The certified dating coach used her insights and experience to develop effective dating strategies, and now she wants to spread the word far and wide. She has shifted gears to produce more free content through her website and podcast as well as group workshops and additional content for brands and major media outlets. By expanding her media offerings and the reach of her podcast, Dates & Mates, Damona can draw more eyes to her message and impact many more lives than she could as a one-on-one coach. Damona Hoffman met the love of her life on a dating site over a decade ago, so she knows how life-changing creating a dating profile can be. As a professional dating coach, she encourages her clients to think strategically about dating and create engaging profiles and messages that’ll make them stand out. Although she started her career as a casting director in Los Angeles, Damona found her calling as an online dating guru in 2004 when her friends and family members asked her for advice on how to write a solid dating profile. She approached dating profile photos the same way she did an actor’s head shots and looked at the first date as an audition, which helped her friends and clients get the part as someone’s new leading man or lady. For the last decade, Damona has focused on helping her clients navigate online dating. She has developed step-by-step online courses and personalized coaching programs to support modern singles. But now she wants to make her advice more accessible to people everywhere. Damona Hoffman used her marketing skills to establish a successful coaching business. As the official Love Expert of BET.com, Damona covers celebrity dating news and trending dating stories. She is also featured regularly on CNN’s Headline News (HLN) as a recurring relationship contributor, and her work will appear in The Washington Post this fall. In 2012, Damona launched a radio show and podcast about love in the modern world. Dates & Mates with Damona Hoffman allows the dating coach to share her advice and discuss the latest trends with experts in the field. She and and her co-host dive into hot topics in the dating scene, including marriage trends, hookup culture, single parenthood, and bad kissers. The podcast blends informative content with entertaining stories so listeners have fun while learning about the dating world. Damona uses this channel to highlight breaking news in the dating world and make it actionable for listeners so they can improve their experiences in love by using the right tools and maintaining a positive mindset. Damona’s core audience are single women between 25 and 45 years old. She said this demographic makes up about 65% of her listeners. “Most of my listeners are single, but we do discuss some relationship advice as well,” she noted. Dates & Mates has been featured by Bustle, Elite Daily, The Huffington Post, and other news outlets. 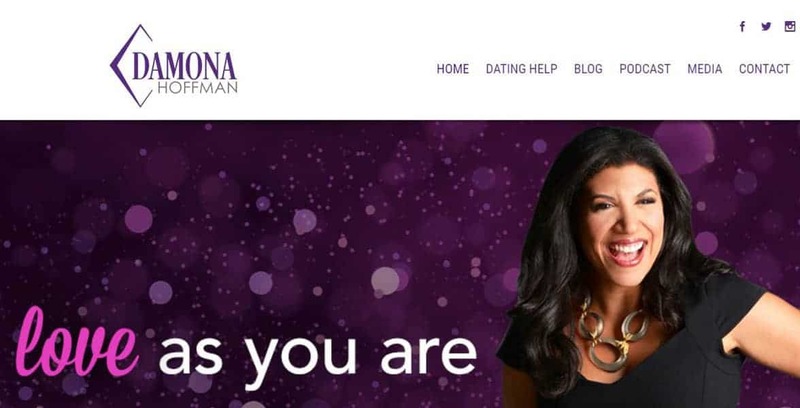 Dates & Mates with Damona Hoffman will return to its sixth season on August 9th with interviews and advice from celebrities, authors, and top experts in the dating and relationship field. To celebrate six years of podcasting, Damona plans to showcase notable TV stars, celebrity guests, rotating co-hosts, on-air coaching, and giveaways. Dates & Mates with Damona Hoffman is available on Apple Podcasts, Spotify, and Damona’s Facebook page where she also gives daily dating advice. Damona’s motto is “Modern love, made simple.” Her goal as a dating expert is to bring clarity to dating issues and enlighten singles on the road to romance. She directs people to tools that can upgrade their dating experiences, and she prepares them to reach their relationship goals by taking deliberate, knowledgeable actions. Damona is a savvy online dating expert with 17 years of coaching experience. Damona once devoted all her energy to helping singles one at a time, but now she has devised innovative ways to deliver advice to a larger audience. She has phased out her one-on-one coaching programs, and she plans to launch group coaching and workshops in 2019. In the next year or so, Damona told us she also intends to organize a fun retreat for her devoted podcast listeners and fans of her television shows on A&E Network. The retreat will be an empowering wake-up call to women who want to transform their love lives. Damona offers life-changing dating advice and encourages attendees to tackle relationship issues with a renewed sense of hope and capability. By arranging group workshops and fun gatherings, Damona will engage with her national audience in a more personal and intimate way than she has in the past. Damona became a fan of online dating long before swiping and mutual matching. She was there on the ground floor and has seen the platform evolve over the last decade. Looking to the future, Damona told us she has a lot in the works at the moment. For instance, she has begun developing a few TV concepts and other secret projects that she hopes to unveil in the next year. She said she is always looking for new opportunities to expand her brand and promote her message through various media outlets because that’s how she grows her potential client base and helps more people find love.